Breakthrough Cut Muscle design delivers an extremely controllable and predictable ball flight. The new MP-32 iron with Cut Muscle design technology is the player's club for the modern game of golf. Through intensive research, the Mizuno Design team evaluated the evolution of the game of golf and, in turn, created the new MP-32 iron to maximize performance for today’s more aggressive game. 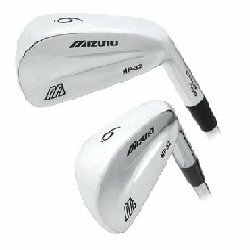 Utilizing their patented Grain Flow Forging technology and the breakthrough Cut Muscle design, Mizuno engineers were able to strategically re-distribute weight to create a consistent sweet spot location, with a deeper center of gravity, while maintaining the maximum amount of solid feel throughout the set. These features deliver an extremely controllable and predictable ball flight, producing a mid-high trajectory in long irons and a mid trajectory in the scoring irons. From Anonymous of San Diego, California on 12/7/2005 . These clubs are easy to hit and for a blade are very forgiving. The muscle design gives me the control and power that I need! 12/7/2005 – Do these irons come in a graphite shaft? Response From FirstFairway: Unfortunately, this irons are only available in steel shaft.